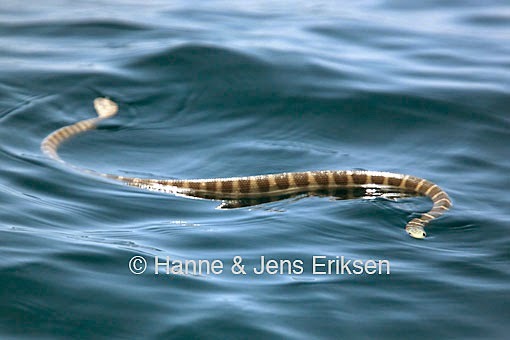 Annulated sea snake Hydrophis cyanocinctus, photographed by Hanne & Jens Eriksen. The Hydrophiinae is a group of sea snakes found in tropical waters of the Indo-Pacific. Members of this group are viviparous, and have a paddle-like tail with elongate neural spines (Naish 2010). [R13] Roux, J. 1913. Les reptiles de la Nouvelle-Calédonie et des îles Loyalty. In Nova Caledonia: Forschungen in Neu-Caledonian und auf den Loyalty-Inseln. A. Zoologie vol. 1, Heft II (F. Sarasin & J. Roux, eds) pp. 79-160. C. W. Kreidels Verlag: Wiesbaden.